Easeus Todo Backup is free backup utility. Like any other backup tools it will back up the complete current start, data settings and all or the things that you want to backup. This helps in restoring the system to the previous section where the PC is working without any issues. 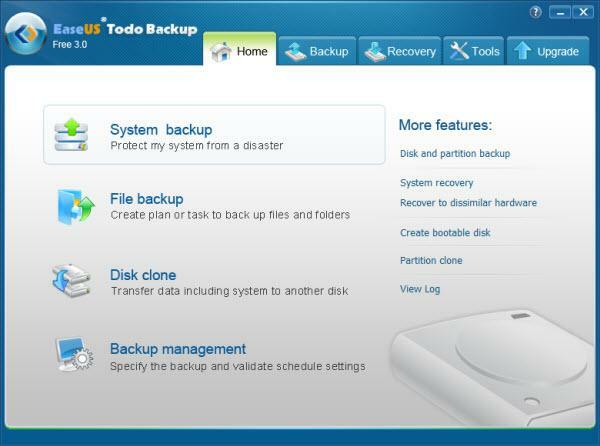 Easeus Todo backup tool will help in restoring the PC if it was accidently got crashed or any other calamity. Its disc cloning feature helps you to transferring/migrating your operating system and data to the new hard disc when it is time to replace the old one. Some of the key points in this application is though EaseUS Todo Backup 3.0 is available for free download it has a lot of use full features and we can manage the options very easy as this Easeus Todo backup tool is user friendly and simple to monitor the settings. You will be you will be guided step by step by its screen instructions, so there is no need of much skills to operate this application. It helps the system administrators to back up the data time to time without losing any files. It makes the IT people life simple as they can easily back up the data. Backup system partition to image: Backup the entire system partition, including the system state and all files to an image file. Easy to store and restore. Backup partition(s) or disk(s): Backup the whole disk including the operating system and all data to an image file. Easy to restore or migrate to other disks. Restore hard drive and operating system in Windows: all the previous backed up disk and system image can be restored within minutes. Restore the system partition by bootable CD. Backup priority: It will be faster to complete the operations if the priority is higher. Compress image file: The image file will be smaller if the compress level is higher, so it will save more space and it is more convenient to store and transfer. Image file splitting: There are different upper limits for different storage, so it is necessary to split the image and fit different storage devices. Processor : Intel Dual core 2.0Ghz or AMD Athlon Dual core 1.9Ghz. RAM : 512MB is needed to run the software perfectly without any problems. Hard Disk: 512MB Free Space is required before installing the software. User can also check latest versions of Easeus Todo backup tool from Official Site HERE. And this free software is especially developed for both home and business users for backup their personal data. For downloading the current free version 3.0 click on below link the download starts automatically.